With high yield all the rage these days, I thought it might be worthwhile aggregating tweets / posts going back to the beginning of this credit cycle to outline where we've come from and to share some thoughts on where we might be going. Curious if this format is helpful or too disjointed. Backdrop... how did we get from the distressed 2008 (a 20%+ index yield), to sub-10% yields and a risk on mentality? In March 2009, corporate bonds appeared to be a screaming buy and the Fed had an outsized impact getting spreads (and yields) much lower - much quicker than I thought was possible. Once things calmed, why was there a reach for yield? Because it was the only place where yields were high. Despite the reach, I didn't mind high yield back in 2012 when rates backed up to 8% given where we seemed to be in the credit cycle (i.e. early). Yields went from over 8% to under 5% within 6 months. At that point (and since), I could not get my head around high yield valuations. Especially when viewed relative to stocks, once the yield on high yield bonds < earnings yield on stocks. Interesting back and forth in comments of this tweet. Some very smart people couldn't see a situation I thought / think has a decent probability. High yield underperformance even without stock underperformance given extreme valuations of high yield. Not sure I've seen such negative twitter sentiment for an asset class (high yield) that is up 4.5% YTD and up MTD. Despite that "sell-off", yields in the lowest quality segment were still absurdly rich, but investors calmed their fears and dove back in, despite crazy yields. I've previously outlined that high yield credit risk is typically less ideal than simply gaining credit exposure through stocks and rate exposure through bonds. Now Larry Swedroe outlines the case for avoiding investment grade credit risk altogether. There are many well-documented anomalies in finance. Among them is the surprisingly small return that investors historically have earned for taking credit risk in fixed-income markets—the default premium, as measured by the difference in returns between long-term Treasurys and long-term corporate bonds, has been only about 0.3%—and that stocks with a higher risk of defaulting on debt have produced lower returns. 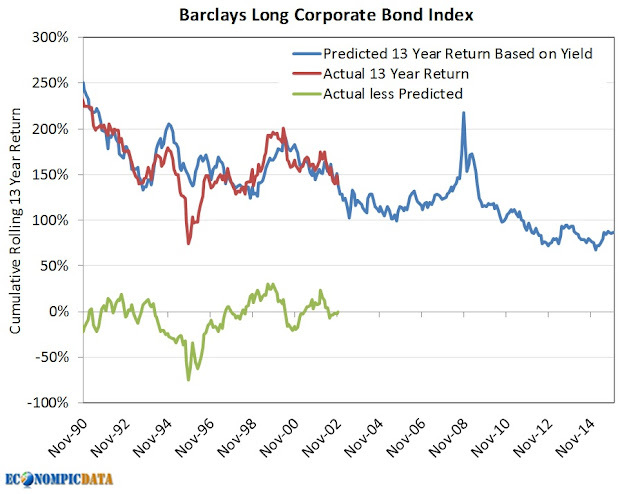 Going back to 1988, which is as far back as Barclays breaks down the returns of the Long Corporate Bond index into the contribution from credit and rates ex the spread, the return from the credit component has actually been slightly negative at -0.09% annualized vs the 8.12% return for a like duration Treasury bond. A similar story plays out in intermediate corporate bond space, where the credit spread contributes only 0.37% of the 7.24% return for the Barclays Corporate Bond Index since 1988. The story is more nuanced than "credit always underperforms the yield" as yield is generally a great predictor of future returns, but yield should generally be viewed more as the ceiling for future returns than actual future returns. The issue is when there is stress in the market, such as during the financial crisis when 13 year cumulative performance (the rough duration of the index) of long corporate bonds underperformed the yield's "predicted" return by almost 80% (the 13 year forward performance starting in 1995 ended during the 2008 meltdown). My general view of credit is to avoid it unless you feel you are being more than fairly compensated. 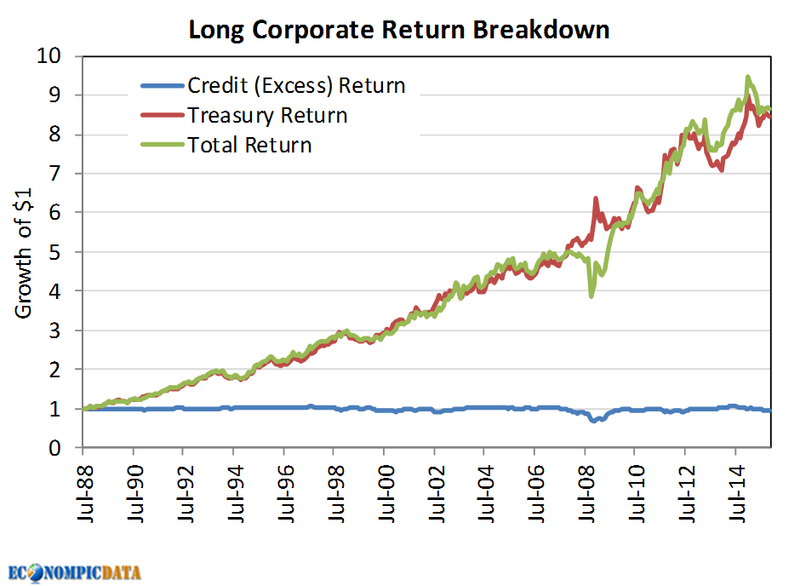 Even if you miss shorter periods of relative outperformance (vs treasuries), allocating only when credit looks like a screaming buy will likely result in a much better long term return profile. In the case of long corporate bonds, allocating only when the spread of long corporate bonds to treasuries was greater than 200 bps (something that occured just 20% of the time), returned 1.1% annualized more since that same 1988 start. While the underperformance of high yield bonds since my post The Case Against High Yield has certainly made high yield bonds more attractive (yields went from sub 6% to north of 8%), I still prefer the risk/return profile of a stock/bond allocation (more here). For those that are looking for a higher yielding fixed income alternative with limited currency risk and the potential for U.S. interest rate diversification, dollar based emerging market fixed income may be an interesting alternative. 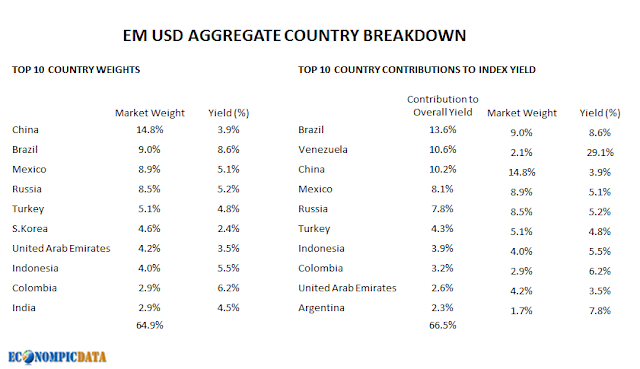 The Barclays EM USD Aggregate Index is a flagship hard currency Emerging Markets debt benchmark that includes USD denominated debt from sovereign, quasi-sovereign, and corporate EM issuers. The index is broad-based in its coverage by sector and by country, and reflects the evolution of EM benchmarking from traditional sovereign bond indices to Aggregate-style benchmarks that are more representative of the EM investment choice set. At present the index is made up of ~75% sovereign debt and ~25% corporate debt, all denominated in the dollar, while the below table breaks down what it looks like in terms of country composition. Interesting to note that while only 2% of the portfolio is composed of Venezuelan debt, that 2% contributes more than 10% of the overall yield of the index (in other words, the higher yield is certainly not risk-free), but the index does provide a pretty wide breadth of exposure. The case for EM USD Aggregate exposure is simply a relative valuation story. Despite periods of heightened turmoil within emerging markets over the last 20+ years, the yield to worst of the portfolio has generally been a pretty good predictor of future returns (note six years is used for the forward return projection given the duration of the index has fluctuated between around 5-7 years going back to the 1993 inception). 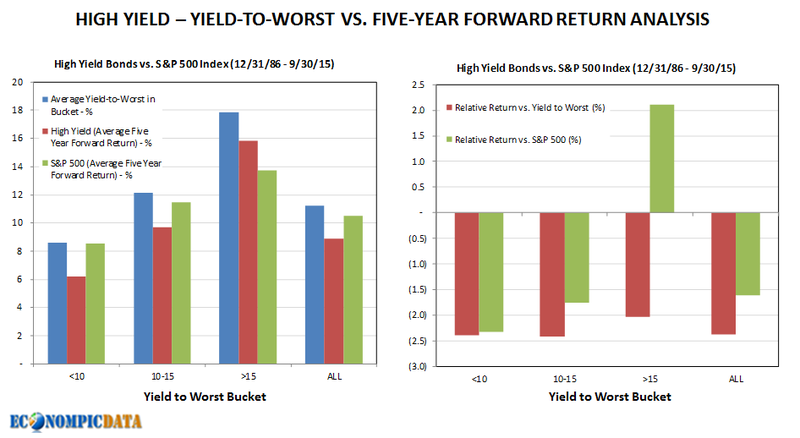 At the current yield of almost 6%, forward absolute returns are likely to be favorable. The higher yield becomes more intriguing when viewed relative to the yield of the U.S. Aggregate Bond index. 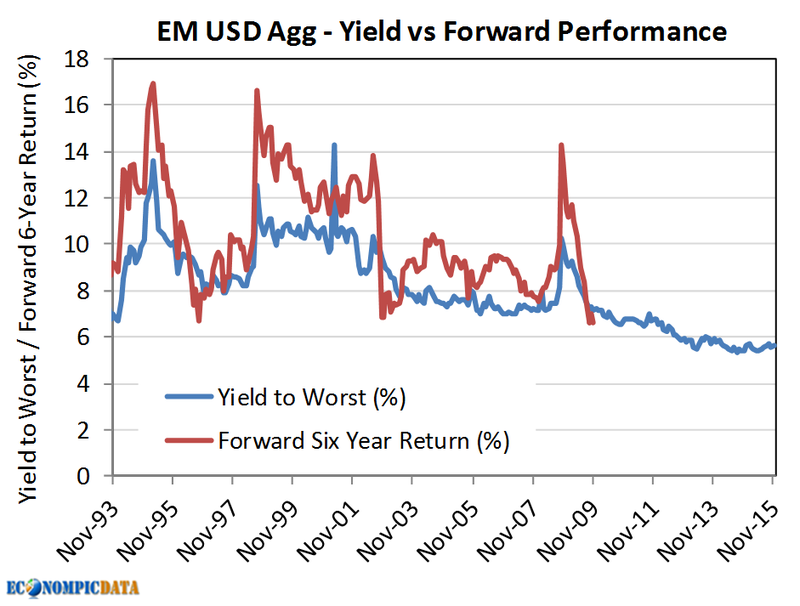 The below chart is similar to the one above, but is shown with yield to worst and forward returns relative to that of the U.S. Aggregate Bond index. 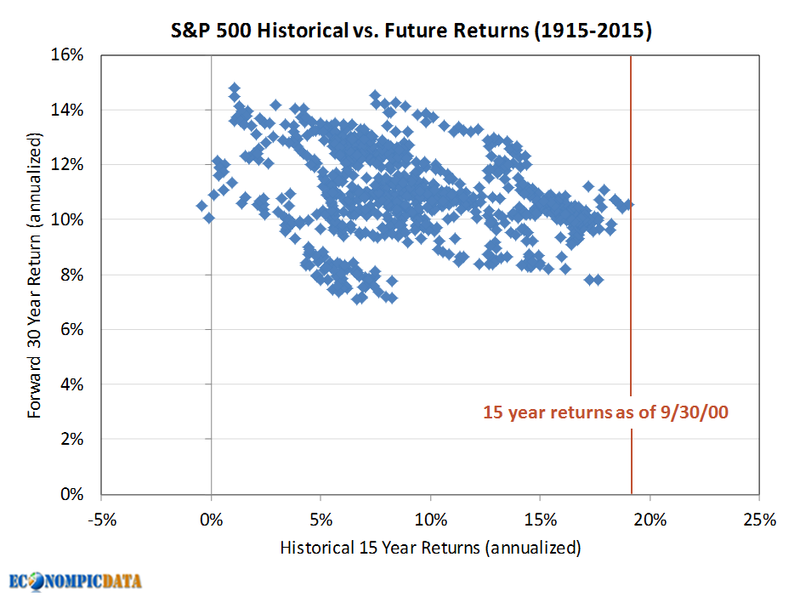 In this case the relative yield advantage has been a pretty consistent precursor to future outperformance. A notable exception is the underperformance in the mid 1990's which coincided with six year returns impacted by the 1998 emerging markets crisis (though the yield advantage was sub 2% then vs almost 4% today). 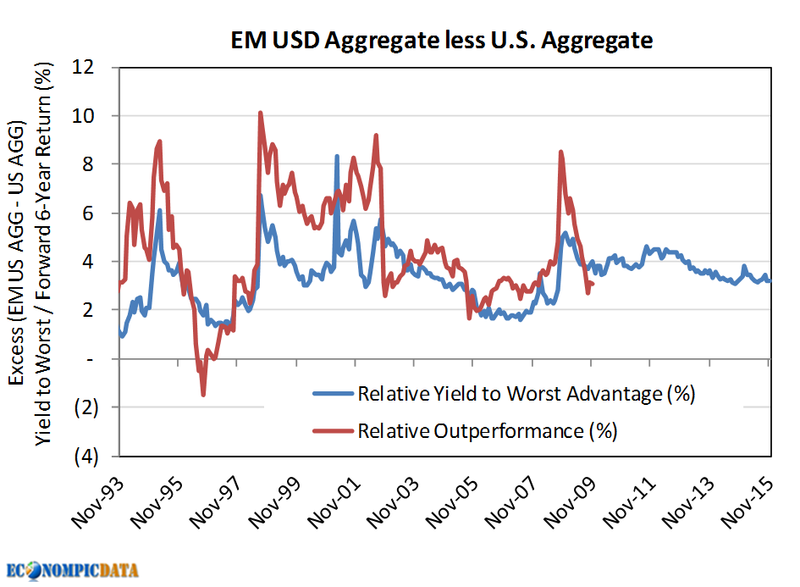 While emerging market bonds are certainly not risk-free, the US dollar denomination protects an investor from a direct impact should the dollar continue to strengthen (though countries trying to pay back dollar denominated debt with a weakened currency are certainly indirectly impacted), while relative yields that are near all-time wide levels vs the US Aggregate index seem attractive given the "emergence" of emerging market countries on the global economy over the more than 20 years since the index incepted. Add in the potential diversification benefits moving some fixed income away from US monetary policy may provide and you get what is in my view a strong case for a strategic allocation to emerging market fixed income. I often read that valuations don't matter over the short-term (a case often cited against market timing). Over very short periods (hours, days, etc...) this certainly may be true, but while there can be a lot of variability around month-to-month or year-to-year performance, I completely disagree with the sentiment that it doesn't matter. That said, there are better ways than just using current valuation levels for an investor to time markets which I will outline below. Before getting into my analysis supporting the theory that valuations do in fact matter a LOT, especially when you use the information embedded in momentum as support, I did want to highlight a recent research paper / article outlining valuations don't matter that simply appears to be wrong. when the current P/E was between 10.4 and 13.3, the one-year forward return was 7.3 percent. When it was higher, between 16.4 and 18.9, the one-year forward return averaged 11.7 percent. 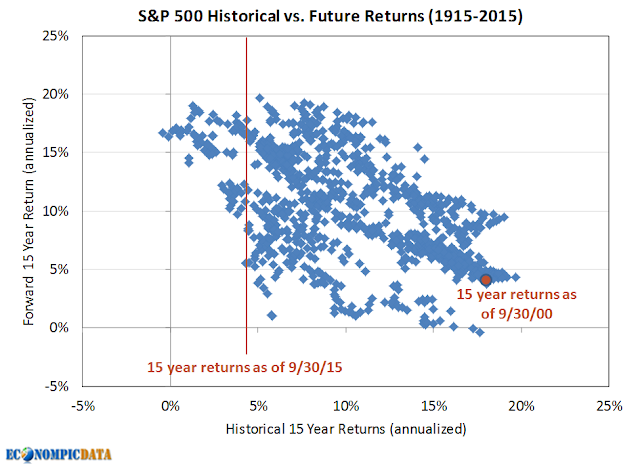 And when the current P/E was above 19, the one-year forward return averaged 10.0 percent. While I completely agree that one year returns are noisier than 10 year returns, the above results truly surprised me. While any one year period could have much higher / lower returns (i.e. the range of outcomes should be wider), over long periods of time the average one year forward performance when valuations are cheap shouldn't be that different than the average 10 year forward performance (it should average out to roughly the same figure). 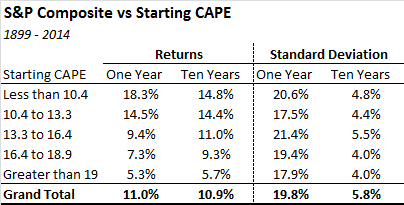 Given my surprise, I decided to recreate the results in the paper using Shiller CAPE for my P/E over that same 1899-2014 time frame. The results in the table below make it likely that the analysis in the paper is either flawed (they do use a weird 3-month lag for earnings) or is simply wrong (my personal view). 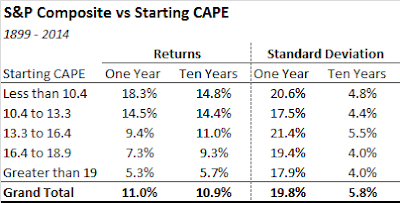 As the table outlines, the results not only show that high valuations = lower returns over one year, but the average one year return is even more dependent on valuations (on average) than ten year returns. You can also see that the range of outcomes is much more dispersed over one year than ten years. I had run the analysis below prior to my attempt at recreating the above data, so my methodology is a bit different. In the example below, I use data going back to 1881 (which is aligned to the inception of the Shiller CAPE time series) and I separate one month forward returns by whether or not the S&P composite had a one year backward looking return that was positive or negative. Below are the same data points in a table form and in a scatter plot. 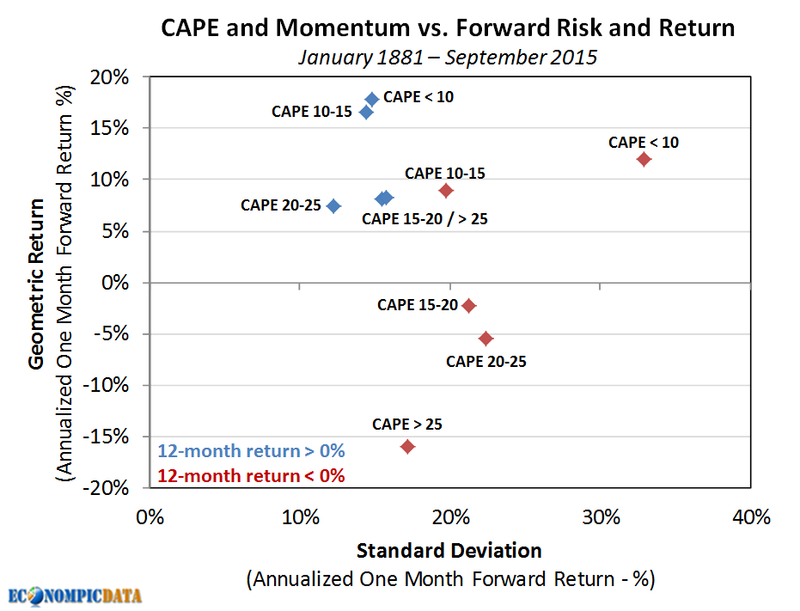 What is easily discerned is that regardless of momentum, cheap valuations are generally good for returns (though extremely cheap and negative momentum has had some severe volatility - see standard deviation for periods when CAPE < 10), while high valuations have generally resulted in pretty strong returns when momentum is strong. 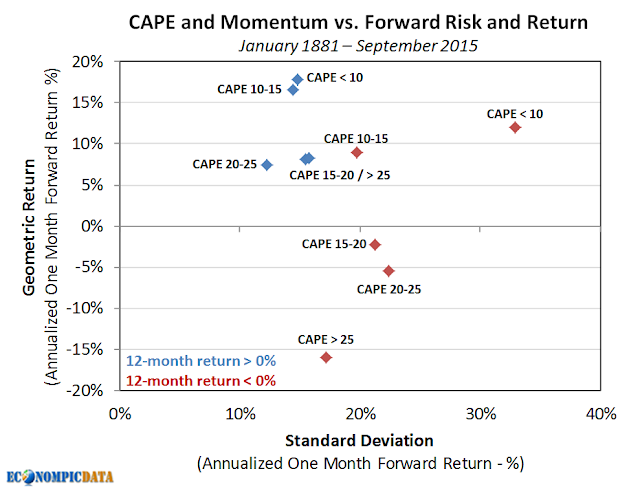 Valuations seemingly only matter when valuations are high and momentum has turned negative (as seen by the negative absolute performance for the three buckets when CAPE > 15 and momentum is negative). My takeaway... the underlying trend of the market is often as, or more, important than stock price levels, but performance will eventually catch up with how much you paid. BUT, momentum may help protect an investor when markets are rich and turn, as well as help keep an investor appropriately in the market even when valuations appear stretched. The counter argument to the bear argument can be seen in the chart below which compares the same 15 year historical returns on the x-axis with 30 year forward returns on the y-axis. As outlined in my previous post, returns tend to smooth out over 30 years, thus it matters a lot less what you pay for stocks over 30 years than over 5, 10, or even 15 years because more of the return is composed of fundamentals (i.e. dividends, buybacks, etc...) than multiple expansion / contraction as compared to shorter periods. Thus even extreme valuations have historically delivered 30 year returns I think most investors would find acceptable at the moment. My take? Right between the two. I am not nearly as scared by current valuations, peak margins, etc.. as bears (especially over longer time frames) and I am not remotely a bull either. That said, I'm also not worried about a short term correction that would likely create a much better buying opportunity in the future. Ben Carlson of A Wealth of Common Sense blog (and author of a great book by the same name), had a recent post Playing the Probabilities outlining that time has been an investor's best friend (for those investors that have had in some cases quite a bit of time), pointing to the following table. The worst total return over a 20 year period was 54%. But the worst 30 year total return was 854%. While I certainly agree with everything he outlined, he did ask the following question. Has anyone figured out a better way of compounding your money in stocks beyond increasing your holding period? Not many. And the updated table with some additional bells and whistles (note there are some very slight differences with the returns Ben produced, but the message is identical). 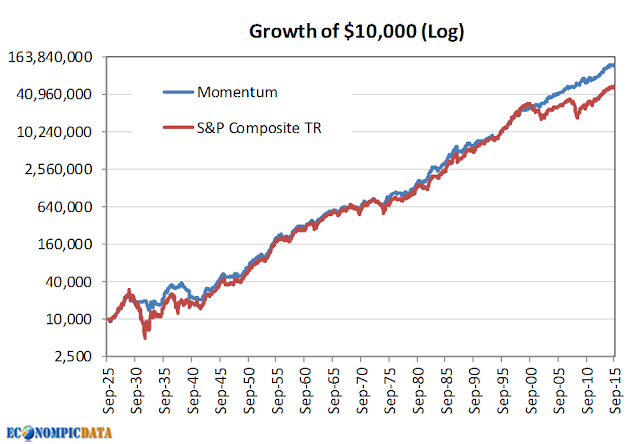 While there is no free lunch (in this case, an investor gives up some upside over shorter time frames), using these basic momentum rules resulted in no negative returns over any ten year period and actually increased the long-term returns over this 1926-2015 time frame, making time an even better friend for an investor. As unnecessary as it may seem, contrarian investment managers need to be even more consultative with their clients than managers more aligned with market sentiment, otherwise clients won't be able to handle the extended periods of relative underperformance a contrarian investor is likely to face from time to time. 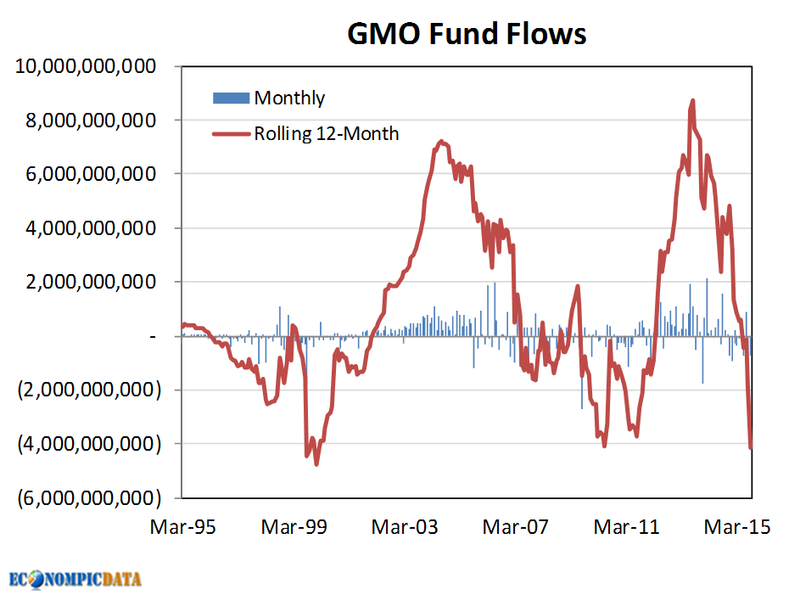 In the case of GMO, while the long-term performance of many of their strategies is pretty strong (and tend to materially outperform when markets turn), the performance captured by their investor base is typically quite poor. One example being the GMO Benchmark Free Allocation III, a fund in which the average investor has underperformed the fund by 3-5+% over 3, 5, and 10 years. As a result, despite a 16th percentile Morningstar rank in terms of fund performance over 10 years, investor performance only ranks 74th. In other words, their investor base historical zigs when they should zag... adding money to the contrarian GMO after markets have tanked (when they should be taking market risk) and piling out of the contrarian GMO after markets perform well (when they should be taking risk off the table). Thus, it was relatively alarming to see that funds flows at GMO have been negative $4.2 billion over the twelve months through 9/30/15, including almost $3 billion of outflows the last two months of the third quarter alone. 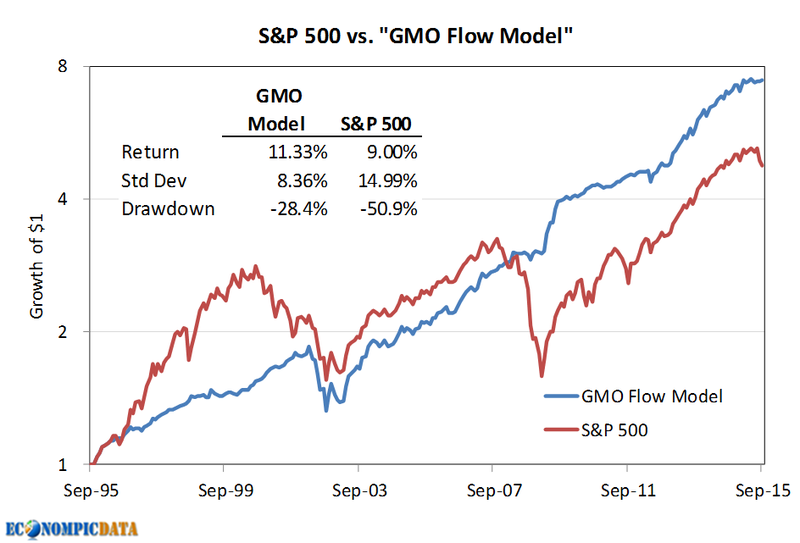 How poorly have investors timed GMO? Let's take a look at how well a model doing the exact opposite of GMO flows would have performed going back 20 years. The result of which is more than 100% of the S&P 500 with almost half the volatility and drawdown. I have a ton of respect for the way in which GMO manages money (their guts to be massively contrarian if that is their view) and I think their thought leadership is about as good as it gets in the industry. The challenge is GMO knows they are smarter than their clients, leading to a more-or-less 'take it or leave it attitude'. But what good are strong long-term returns if an investor is unable to capture them? Most investors know of the VIX Index, but not as many understand what information the VIX provides an investor. Here is my attempt to provide an initial outline of what it is and why the information embedded within the figure is so powerful. In 1993, the Chicago Board Options Exchange® (CBOE®) introduced the CBOE Volatility Index® (VIX® Index), which was originally designed to measure the market’s expectation of 30-day volatility implied by at-the-money S&P 100® Index (OEX® Index) option prices. 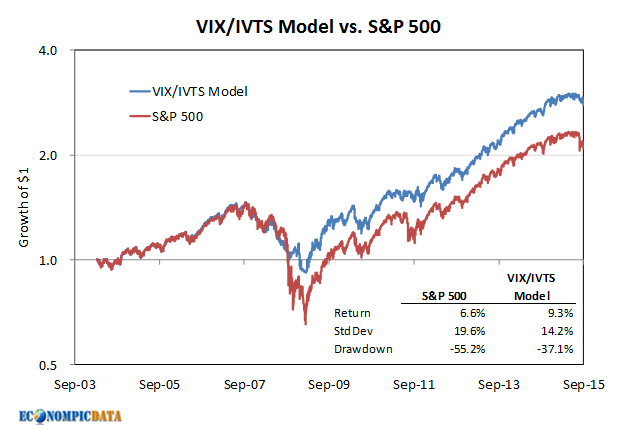 The VIX Index soon became the premier benchmark for U.S. stock market volatility. Ten years later in 2003, CBOE together with Goldman Sachs, updated the VIX to reflect a new way to measure expected volatility, one that continues to be widely used by financial theorists, risk managers and volatility traders alike. The new VIX is based on the S&P 500® Index (SPXSM), the core index for U.S. equities, and estimates expected volatility by averaging the weighted prices of SPX puts and calls over a wide range of strike prices. In summary... the VIX is a reflection of the market's expectation of future market volatility. As Eddy Elfenbein of the great Crossing Wall Street blog outlined back in 2012, you can take the current market's expectation of future market volatility (i.e. 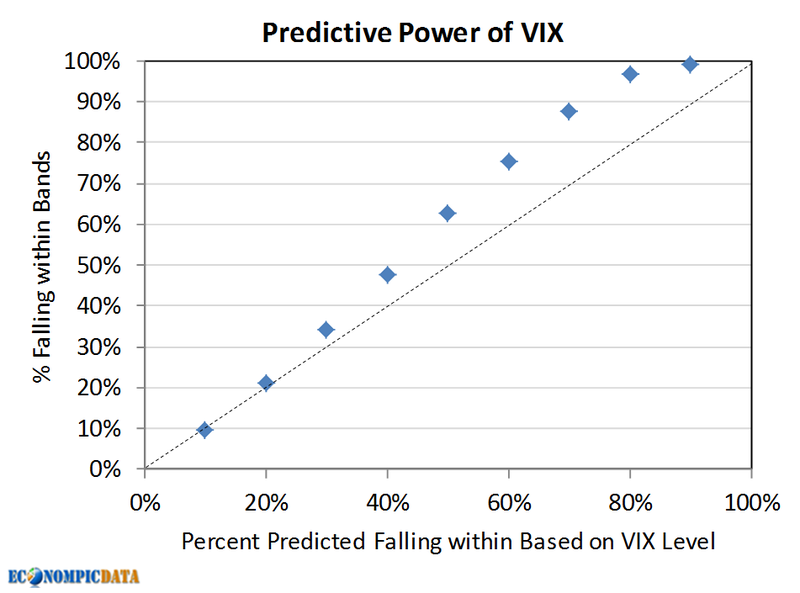 the VIX), to determine the expected range of future stock market returns. The 3.46 denominator is simply the square root of 12, which takes the VIX from an annualized figure to a monthly figure given there are 12 months in a year. In reality, the VIX typically overstates the level of market risk and understates the results within the band. As the chart shows below, the confidence bands described by the VIX understate the "capture rate" of the bands, especially at higher confidence levels. In the chart above, one standard deviation bands should capture 68% of outcomes, but instead have captured 85% of outcomes. As a result, while an investor can utilize the VIX to scale equity weights to smooth out returns, an investor should rarely be buying volatility protection. Back in August I outlined why I thought the plain-vanilla value premium had been compressed to the point growth had and was likely to continue to outperform in my post Death of (Plain Vanilla) Value - Long Live GARP. This post is meant as a follow up and suggests a few frameworks as to how an investor might allocate based on the given "value of value". 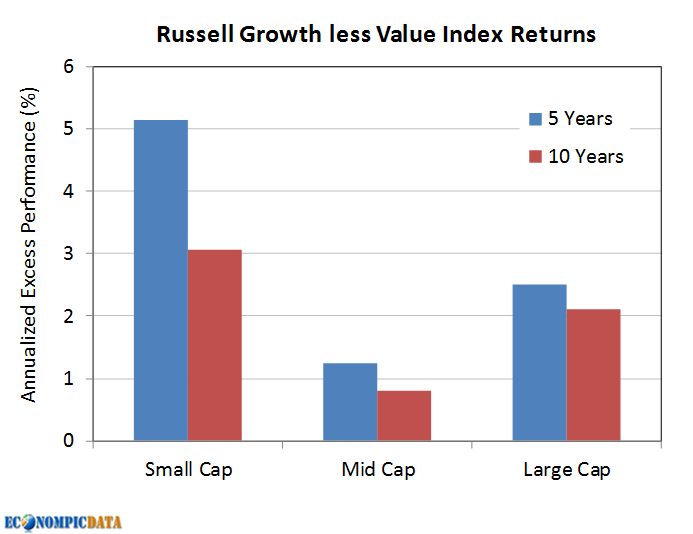 Value historically outperforms growth when stocks making up the value indices are beaten down relative to growth. Thus, it should be no surprise that value materially outperformed following the Internet bubble as value stocks were massively cheap relative to growth stocks (see below). The issue over the last decade plus is that many investors have piled into value ignoring the driver of value's historical outperformance, resulting in a "value discount" that is historically narrow. The next chart outlines in more detail why the discount matters, with the starting "value discount" on the x-axis and the subsequent 7-year excess return on the y-axis. You can see the linear relationship between the "value of value" and future value excess return to growth. When the discount is high, outperformance of value vs growth is likely. 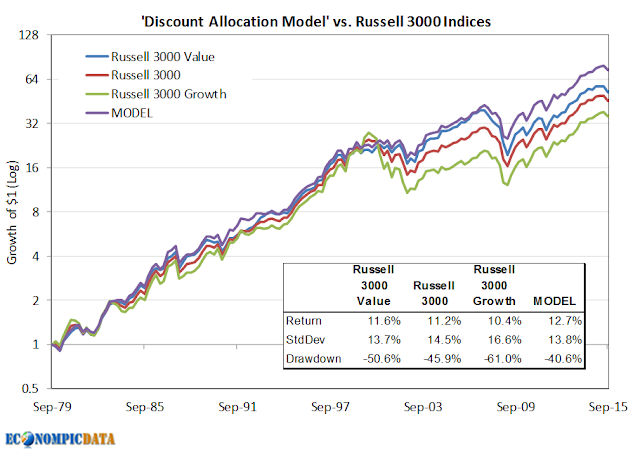 When the discount is low (which happens to be where we currently sit), underperformance of value vs. growth is likely. While there are a multitude of ways this insight can be put to use, below are a few simplistic ways that only require making a reallocation at most quarterly and has been more likely to require a reallocation once every 3-5 years. 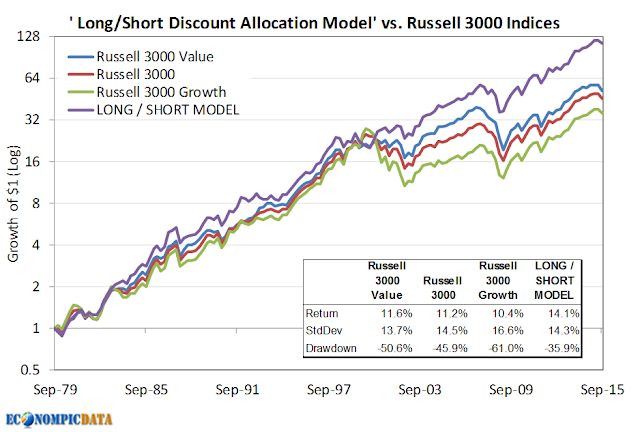 Note this analysis does have a huge data mining issue as we know in advance that a 25% and 30% value discount are thresholds where growth and value have diverged in the past - though less of an issue today as we are near all-time tight levels. 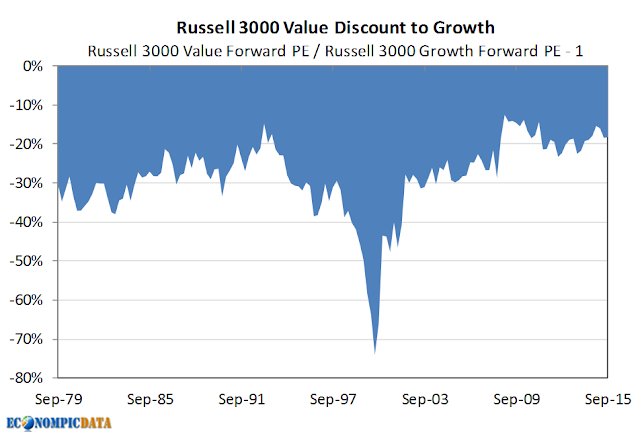 As an aside, as the charts below show it wasn't until the late 1990's that the performance of the Russell 3000 Value and Growth indices diverged. 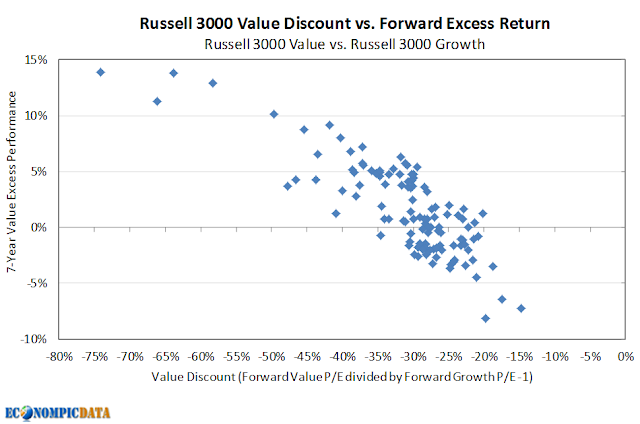 It was only when investors initially flocked to growth (and later value) that we have seen distinct differences in the "value discount" and in subsequent performance. I've previously posted my broader thoughts on high yield (that there is typically limited to no benefit vs. a stock / bond allocation), but the below chart provides some additional context I thought worth sharing. The left hand chart breaks out five year forward returns vs. various starting yield-to-worst "YTW" buckets of the Barclays High Yield index (along with what the average starting yield was for the index within that bucket over the time frame). It should be no surprise that the average starting yield anchors what the return will be (when yields are low, returns are low), while the right hand chart outlines the average underperformance vs. the starting yield has been roughly 2.0-2.5% / year, irrespective of the starting yield (high yield isn't called junk for nothing). Both charts show that equity market performance is highly correlated with the credit premium; when the YTW of high yield bonds is high, it is highly likely that the equity premium is high too - leading to higher equity returns. On the other hand, when yields are low and the credit premium (as well as equity premium) is low, stock and high yield returns are more muted. However, the unlimited potential of stocks vs the capped upside of high yield at low rates has lead to consistent equity outperformance when yields are low, while high yield has performed exceptionally after yields were completely blown out (post the 2008/09 financial crisis). At the current yield to worst of 7.6% and a spread of almost 6% to treasuries, we should expect returns to be no more than 4.5-5.5% over the next five years. Nothing special for the potential risk, but much better than the sub 5% yield we saw a bit more than a year ago. The below analysis was purely an accident. I was actually looking into periods the U.S. stock market "suffered" a 10% drawdown for the absolute opposite reason; to show that a buy and hold investor should likely ignore these regularly occurring events. How regular? 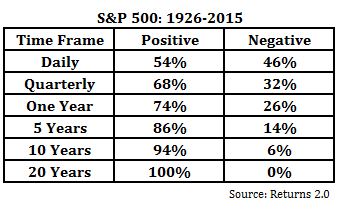 I looked at every calendar year since 1960 and looked at various correction levels. Turns out 94% of all calendar years see at least a 5% correction, while 53% of all years see a 10% correction. Maybe this recent 12% correction isn’t so alarming? 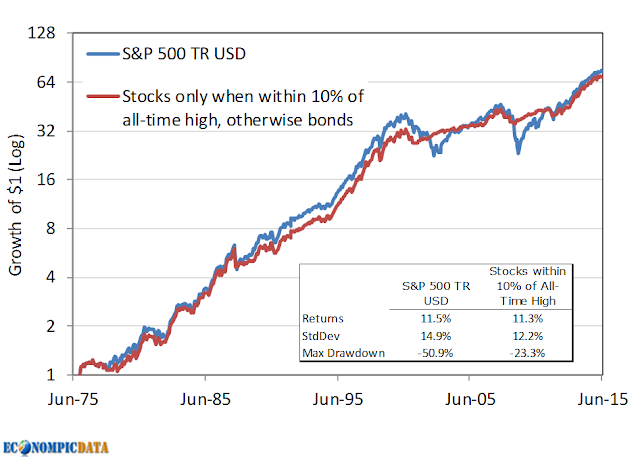 So... what if an investor were to sell-out of their U.S. stock allocation and shift it into bonds whenever one of these standard 10% drawdowns occurred and were only willing to go back into stocks when they once again were within 10% of its all-time high? Well going back to 1976 (the inception of the Barclays U.S. Agg bond index), the results were surprising. Almost 100% of the return, about 20% less volatility, and less than half of the drawdown. As interesting is how well it kept up with the stock market in all periods except those that followed severe drawdowns. This is largely due to the rarity of which 10% drawdowns become 30, 40, or even 50% drawdowns, so the strategy was at most times fully invested. Typically, longer-dated VIX futures are more expensive than VIX futures expiring in the current month, as there’s a greater chance of stock swings over a longer time period. That makes for an upward sloping futures curve. In times of stress, when investors are very fearful about the stock market over the next few weeks, they bid up the prices of short-dated futures more than the prices of the longer-dated futures. That phenomenon is known as “backwardation,” meaning a downward sloping futures curve. The article itself pointed to the relatively flat term structure (as of Friday), stating that an elevated VIX for the foreseeable future is a potential outcome. I've written in multiple iterations (here and here are two examples), that the VIX does a great job of predicting future levels of volatility AND risk-adjusted returns. What I'll take a look at now is whether the term structure adds additional insight (sneak peak... it just might). One way to make an allocation is to simply allocate to a long VIX futures position only when they have a tailwind vs. headwind. Simply calculate the term premium (a simple way is to use the VIX/VXV ratio - details of what that is by the great Bill Luby here) to determine contango or backwardation (in this case when the VIX/VXV is less than or greater than 100) and only allocate to UVXY when it's above 100. To put some numbers behind that statement, the average modeled daily performance of UVXY is -1.1% when the ratio is < 100 (2500 trading days) and 5.0% when the ratio > 100 (378 trading days) since 2004. So... in addition to simply looking at the level of the VIX (in this case whether the VIX is greater than 20), we also look at the levels of the IVTS (in this case if it's greater than 100). 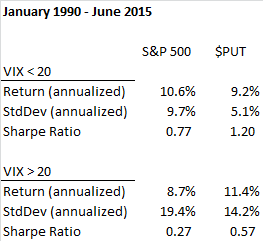 The table below outlines the results of next day S&P 500 returns given the level and term structure of the VIX. Some highlights... the geometric returns are broadly the same whether the VIX is above or below 20, but the volatility is MUCH lower at low levels of VIX (resulting in higher levels of risk-adjusted returns at low levels of the VIX). However, the addition of the IVTS signal shows a lot of interesting promise. When both signs are in disagreement, returns are by far the best, with returns of 11.9% when the VIX > 20, but the IVTS < 100 and a whopping 105% when the VIX < 20 and the IVTS > 100. When both signals are telling investors to tread carefully (i.e. 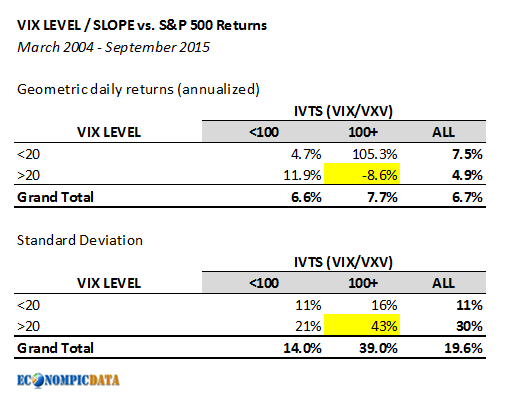 VIX > 20 and IVTS > 100), returns have been abysmal, with returns of -8.6% and volatility north of 40%. Something to keep an eye on as the warning signs are both currently flashing red. Back in May, I posted A Guide to Creating Your Own Hedge Fund outlining how the application of momentum to the two worst performing funds within the Morningstar Multialternative category over the previous ten years would have provided an investor with better risk-adjusted returns than the Barclays Hedge Fund index and a lower correlation to equity markets. Now, I'll share how a similar strategy going back a further ten years would have performed using randomly selected funds from the Morningstar Moderate Allocation / World stock universes. As an aside... this isn't too far removed from how I manage my own retirement money. 20% weight to each fund's "path"
The below are my first 5 results (random iterations of the 69 funds) vs. an equal weight of all 69 funds with a 20 year track record and the S&P 500. The challenge (and likely reason why it works) are the extended periods of underperformance an investor using momentum must deal with relative to a long only stock portfolio (these strategies have all materially underperformed during strong bull markets). I''ll save what I view as a potential fix to that for another day. For now, buyer beware... as of 8/31/15, less than 10% of funds within the Moderate Allocation and World categories had positive returns over the previous 9-months. The CBOE S&P 500® PutWrite Index is a benchmark that measures the performance of a hypothetical portfolio that sells S&P 500® Index put options against collateralized cash reserves held in a money market account. 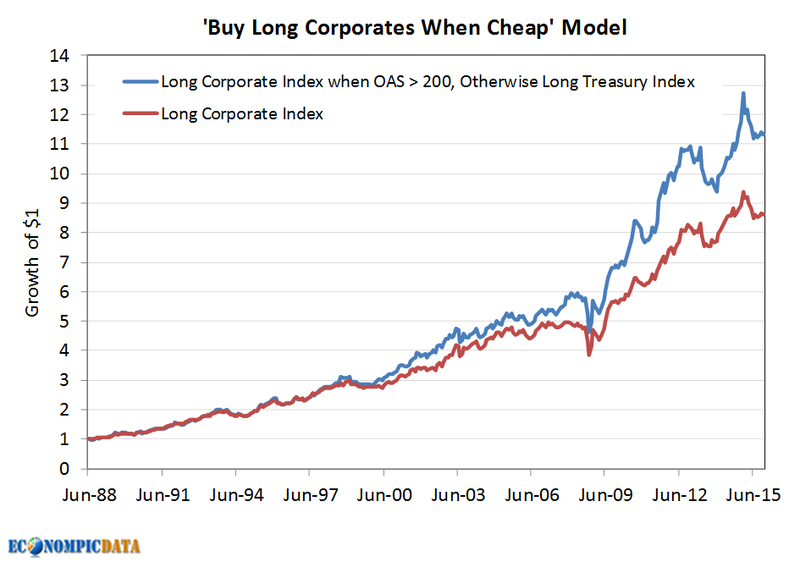 What this means is that the index sells puts at a 100% notional value (i.e. there is no leverage). For those more familiar with covered call writing (i.e. writing calls on the stocks you own, which gives up a less certain upside for a more certain option premium), the chart below highlights that covered calls and put writing result in the exact same economic exposure (the green on the left and orange on the right are identical), which is downside risk commensurate to the stock's decline with upside capped at the premium collected (the below chart comparing the two ignores that premium). 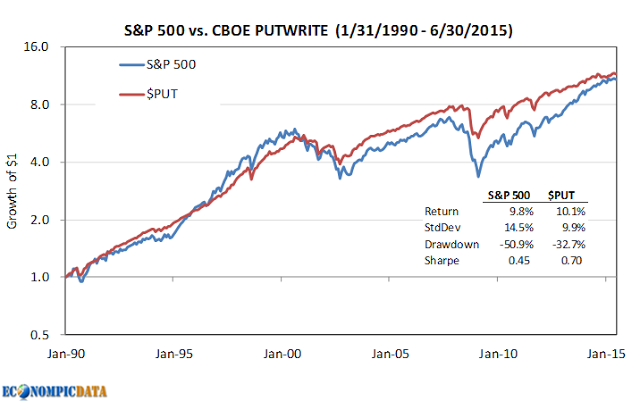 The historical benefit of put writing has been a long run return close to that of the S&P 500 index, with slight underperformance during bull markets and outperformance during bear markets. The PutWrite index can be thought of as an alternative means of capturing the same equity premium; through premium collection in the case of put writing (i.e. collecting the insurance that others are willing to pay to protect their portfolio) vs. the upside of the equity market. 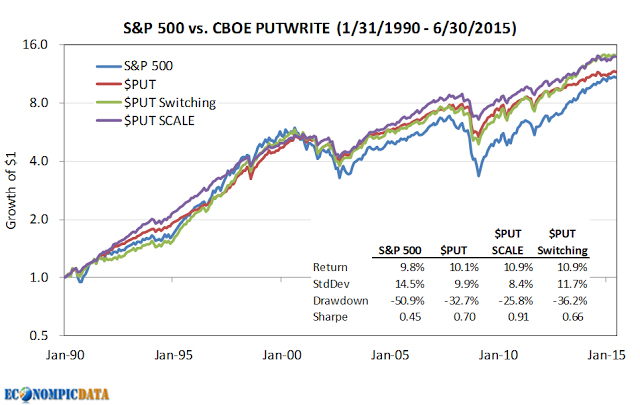 Of note is the PutWrite index has historically achieved this similar performance with a lower risk profile than the S&P 500 (as defined by both standard deviation and drawdown), the reason being that an investor has the same downside risk (the market), but a PutWrite investor collects a higher level of income (the option premium) vs the lower dividend distributions and the option premium increases as market risk increases (while dividends can decrease), helping cushion losses further. The great Philosophical Economics blog wrote a treatise outlining an improved way to manage put writing given that put writing generally underperforms the S&P 500 during bull markets and outperforms during bear market in part due to cushion the higher option premium provides put writing when market volatility picks up (i.e. insuring against a market downturn is more costly when investors view an increased probability of needing that insurance). 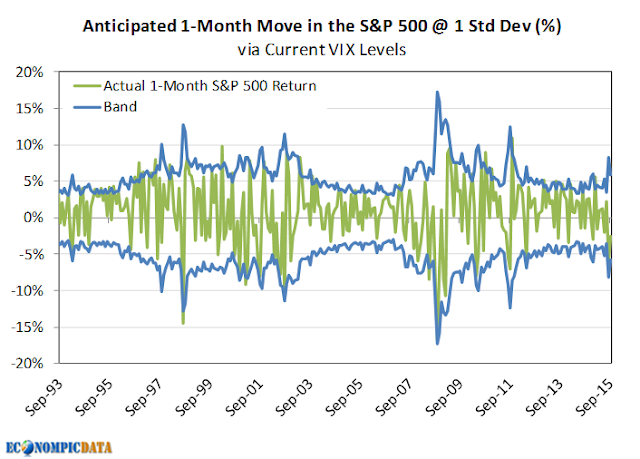 As a result, an investor may be able to increase returns by allocating to PutWriting at month-end when the VIX is elevated (above 20) and to the S&P 500 at month-end when the VIX is more “normal” (less than 20). 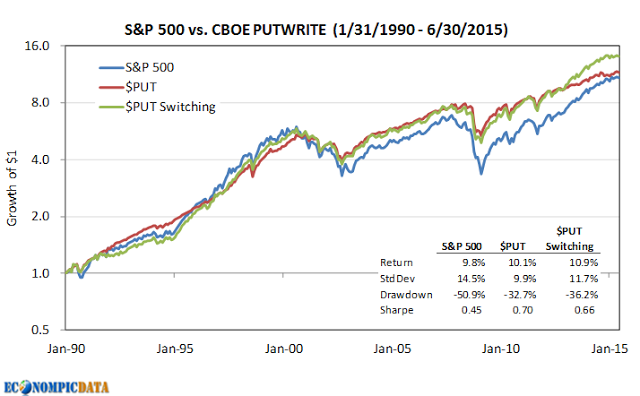 The above rule does improve upon the strategy's absolute return (see "$PUT Switching" in the below chart). YET, that higher return comes at the cost of reduced risk-adjusted returns (higher standard deviation, higher drawdown, and a lower sharpe than the $PUT index itself). While I do think the above is an interesting solution, I think it misses one of the surprising characteristics of put writing... its risk-adjusted returns are actually higher when the VIX is lower. As the table outlines below, the absolute returns have indeed been lower when the VIX < 20 (9.2% vs. the 10.6% returns for the S&P 500), the sharpe ratio of the PutWrite index is a whopping 1.20 during these periods (a huge number for a 25 year time frame as any investor can attest). The reason being the level of VIX (or the amount of option premium received) matters less than the premium collected compared to the puts realized payout (i.e. what the insurance is actually paying out). In other words, it is more profitable to insure a good driver at a low insurance premium than a bad driver at a high premium. If the monthly close of the volatility index (VIX) is above 20, then for the next month invest in the put-write strategy at 67% notional (a 50% reduction) with the balance in 3-month t-bills. If the monthly close of the volatility index is below 20, then for the next month invest in the put-write strategy at 150% notional (a 50% increase) financed at the 3-month t-bill rate. The end result? Improved absolute return and material improvement in both standard deviation, drawdown, and sharpe ratio. As an aside... put writing provides a ton of flexibility for an investor. Unlike covered calls, which requires collateral (the stocks you are writing calls against), put writing simply assumes you are holding 100% cash (t-bills). For those that are willing to be creative, there are a lot of interesting things you can do that can provide returns in excess of cash to further improve returns with limited increase in total risk. An initial investment of more than $450,000 to the ProShares Ultra VIX Short-Term Futures ETN (UVXY) at the open of its October 4th, 2011 inception date (the split adjusted opening price) would be worth just $87 at today's close (this after a more than 28% gain today and more than 300% gain over the past few weeks). Modeling what the performance would have been going back to the inception of VIX futures in March 2004, a $100 million initial investment would be worth a bit less than $5 today (you read that correctly). 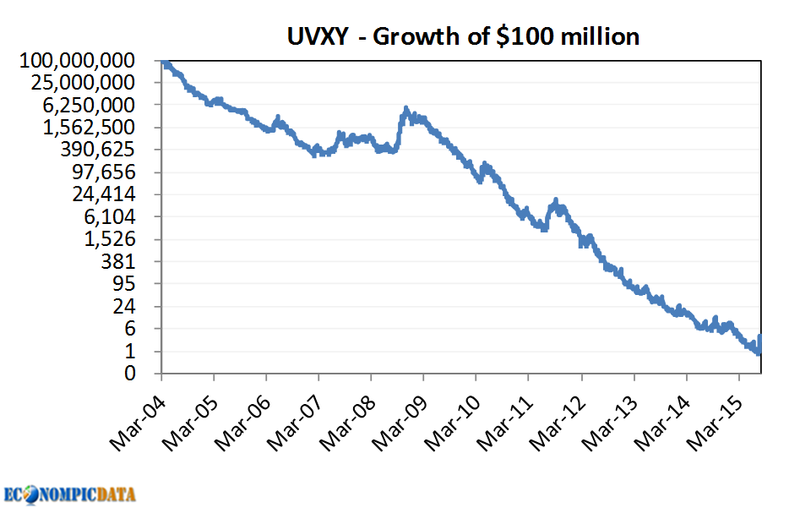 Given the above performance figures, it should be no surprise that UVXY has eaten a tremendous amount of the capital investors have sunk into it. Since its launch, the ETN has seen net flows in excess of $1.7 billion, while current AUM stood at less than $400 million as of yesterday's close (simple math tells you investors have lost more than $1.3 billion in the strategy since inception). This figure may improve short-term, but I all-but-guarantee it will get worse over the longer term. 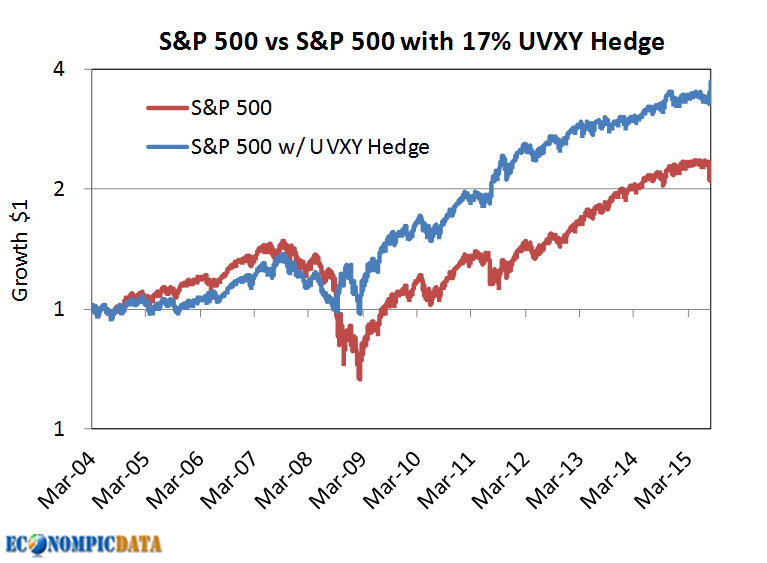 As an aside... how in the world is UVXY accessible by mom and pop investors who have zero clue how it works. The Ultra Fund seeks daily results that match (before fees and expenses) two times (2x) the daily performance of the S&P 500 VIX Short-Term Futures Index. The index seeks to offer exposure to market volatility through publicly traded futures markets and is designed to measure the return from a rolling long position in the first and second month VIX futures contracts. To summarize, the ETN provides exposure to a long position in the front two VIX futures contracts at 200% notional (i.e. it is a 2x levered position). If VIX futures simply followed the VIX, UVXY returns would be extremely mean-reverting as the VIX is one of them most mean-reverting figures in all of finance as it cannot go to zero or infinity. But, while VIX futures do typically move in sync with the VIX index over very short periods (i.e. the exposure most investors in UVXY believe they are getting), it does not over long periods of time. The issue with VIX futures is the term structure, which during calm markets is typically in contango (i.e. VIX futures are priced higher than spot), while during distressed markets is typically in backwardation (i.e. VIX futures are priced lower than spot). UVXY benefits immensely from backwardation because the upward slope of VIX futures owned provides a tailwind to the futures contracts as they approach maturity (while UVXY faces a severe headwind during contango... which is present much more often). Examples of VIX futures in contango (bad for UVXY) and backwardation (good for UVXY) is shown in the two below charts using data / charting from the especially helpful VIX Central (follow Eli on Twitter). All that said, there is absolutely a case for going long VIX futures / VIX ETNs. As the last few weeks have shown, there are very few financial instruments that have a correlation near -1.0 to stocks during periods of market distress. As an example of putting this to work within a portfolio, below is an allocation to the S&P 500 compared against an allocation to the S&P 500 when the term structure is in contango (bad for UVXY), or a 83% allocation to the S&P 500 / 17% allocation to UVXY (UVXY is ~5-6x more volatile than the S&P 500 over the long-term) when the term structure is in backwardation (i.e. favorable to UVXY). The above breaks down to annualized returns of 6.9% for the S&P 500 and 12.4% for the hedged version, while standard deviation moves from 19.6% for the S&P 500 down to 15.5% for the hedged version. In addition, max drawdowns moves from 55% down to 29%. So, while I certainly feel the average retail investor should not be allowed access to something as volatile as UVXY without proof they have a good understanding of the mechanics that drive performance, I do think there is a benefit in using such vehicles for those that understand how they might tame them. Warren Buffett made news this morning, not just for making the largest acquisition of his career, but for making it at a relatively lofty 22x earnings multiple. Warren Buffett is paying a hefty price for the biggest acquisition of his career, now that his Berkshire Hathaway Inc has agreed to buy Precision Castparts Corp in a merger valuing the maker of aerospace and other parts at $32.3 billion. Buffett, known for buying undervalued and often unloved companies, acknowledged the high price. "In terms of price-earnings multiple going in, this is right there at the top," he told CNBC television. 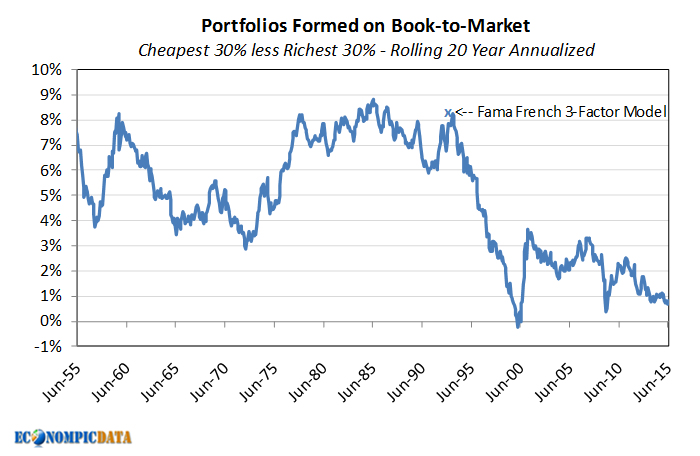 Which brings me back to a chart from my March post outlining The Disappearing Value Premium since the seminal Fama French white paper. More recent data outlining the relative performance of value vs. growth is even more striking, as growth has outperformed value across market caps (small through large) materially over five and ten years. How Can Something Be Hated, Yet Receive the Bulk of Flows? 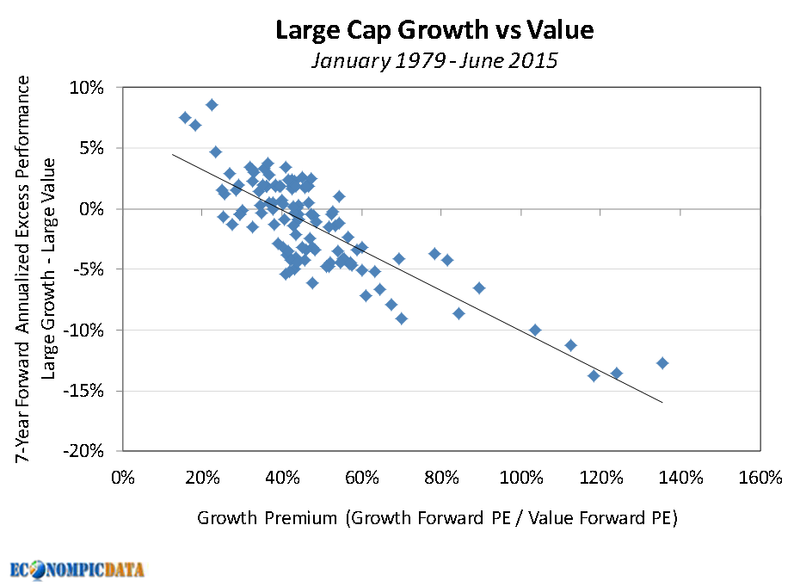 Value traditionally outperformed growth in large part because it was composed of the most hated, beaten down stocks. 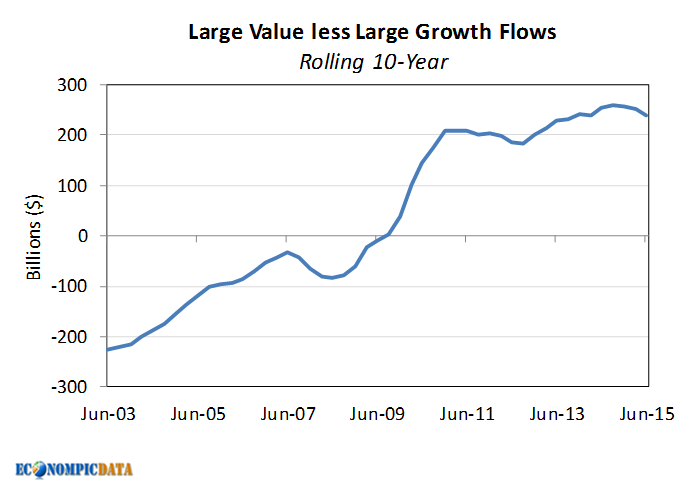 But over the last 15+ years flows have increasingly piled into "value stocks". How can something be hated, yet receive the bulk of flows? To put some numbers to this, $200 billion more has gone to large value vs. large growth in the last ten years alone. An equity investment strategy that seeks to combine tenets of both growth investing and value investing to find individual stocks. GARP investors look for companies that are showing consistent earnings growth above broad market levels (a tenet of growth investing) while excluding companies that have very high valuations (value investing). In other words, while value is by definition "cheaper" if you simply look at price multiples (such as price to book or price to earnings), it isn't necessarily cheaper once accounting for the underlying fundamentals of a business. Growth stocks should trade at a premium to value due to the underlying growth, the only question is by how much. 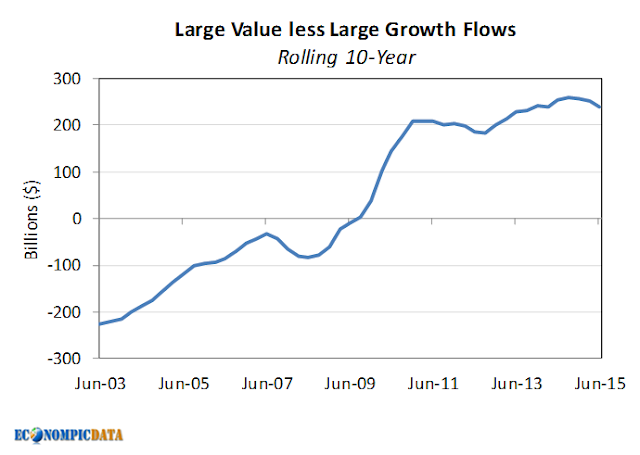 Without getting into the "by how much question" at this time, there has been a material shift in relative valuations between value and growth since those flows have piled in, resulting in a dramatic decline in the growth premium (or the value discount if you want to think in those terms). In June 2000 (around the peak of the Internet bubble), the forward P/E of the Russell 1000 Growth (large growth) index was a whopping 118% higher than that of the Russell 1000 Value (large value) index, but by June 2005 it was down to 45%, and by June 2010 it was down to 19% (right about where it currently resides). As the next chart highlights, the relative size of the growth premium matters; the starting level of growth premium and seven year excess returns have an r-squared of 0.67. 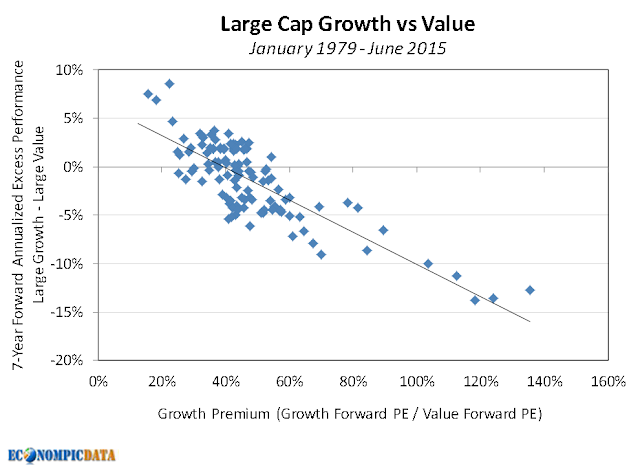 When the forward premium has been less than 40% growth has outperformed value by almost 2% / year over the next seven years, when it has been between 40-60% value has outperformed growth by ~1.5% / year over the next seven years, and when the premium has been greater than 60% value has outperformed by a whopping ~8% / year over the next seven years (again... it currently sits at ~20%). Going back to Buffett's acquisition of Precision Castparts Corp; a multiple of 22x certainly isn't cheap, but it may be reasonable for the underlying fundamentals of the business. If the company can continue to grow top and bottom line figures by double digits, it will certainly look a lot cheaper than the average company in the Russell 1000 Value index trading at 16x that has seen a decline year-over-year in earnings.